I also provide custom framing for up to a 13 x19 print size. I print these orders myself using professional Canon Archival Inks and professional photo paper. Pricing for a 13 x 19 framed print starts at just $50.00, this includes a gallery style black 19 x 24 frame with a white acid free mat. All framed images are sealed for dust and moisture and come ready to hang! Other framing options and print sizes are available. 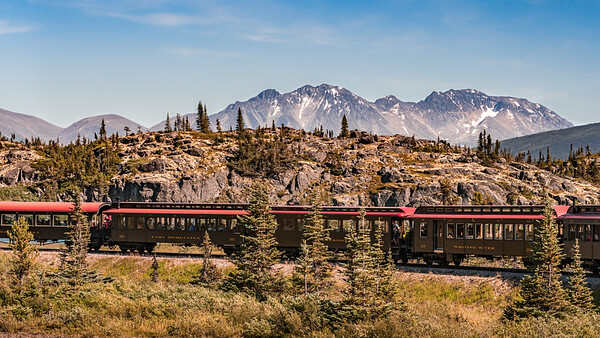 Imaged captured in Skagway Alaska, the White Pass Railroad runs to the White Pass Mountain summit. This same trail was also known as "Dead Horse Trail" due to the many horses that died on the trail during the Klondike Gold Rush of 1896.